Shopping for a new Toyota Camry? With fuel economy less important to buyers in an era of cheap gasoline, the 2018 Toyota Camry Hybrid LE’s 52-mpg combined EPA rating may be the sleeper entry of the lineup. 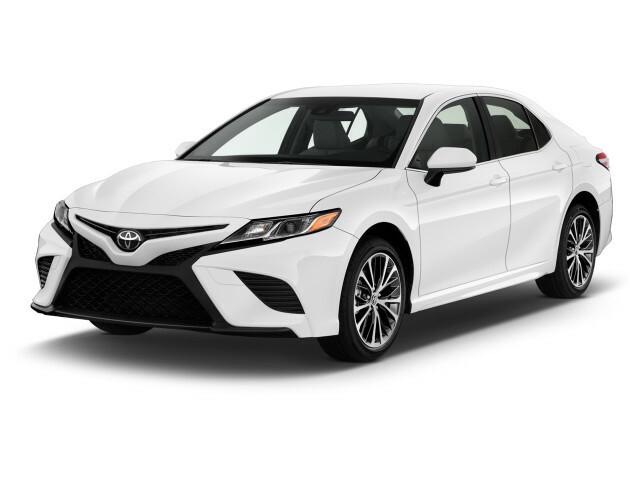 The 2018 Toyota Camry remains among the most competitive mid-size sedans, with a sleeker design, higher fuel economy, and carefully calibrated features and options for every buyer. The 2018 Toyota Camry is one of the most popular cars on the planet, and a bestselling sedan in the U.S. for decades. In an effort to banish the Camry’s bland image, Toyota gave the latest generation a more expressive design, used a more sophisticated suspension to improve driving and handling, and delivered better fuel efficiency than any previous Camry lineup. 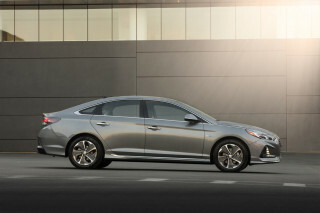 Five trim levels are offered: a base L, a mid-grade LE, and a better-equipped XLE, plus the sporty SE and upscale XSE. The Camry Hybrid has three versions: LE, SE, and XLE. With buyers’ interests in sedans sagging in favor of all sizes of crossover SUVs, this latest Camry is critically important to keep Toyota's highest-volume passenger car at the top of a tough market. 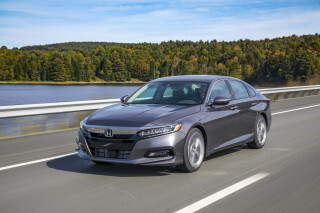 It faces stiff competition this year from a new version of its longtime rival, the Honda Accord, plus a major revamp of the popular Hyundai Sonata. 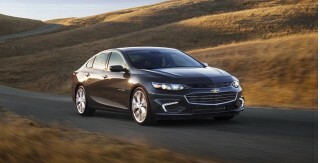 Other competitors include the older Chevrolet Malibu, Ford Fusion, Kia Optima, and Nissan Altima. The new Camry improves on last year’s model in styling, safety, features, and fuel economy, but it’s only average in performance, despite a new chassis. It's powered by a 2.5-liter inline-4 that makes 206 horsepower and manages 32 mpg in most trim levels. A traditional V-6 is still available—many rivals have ditched a bigger engine in favor of turbocharged powertrains—and a hybrid powertrain that returns more than 50 mpg combined. A new 8-speed transmission fitted to the inline-4 and V-6 keeps the Camry creamy on the road. Improved ride quality is apparent, even in base trims, although the cabin in some versions is a little noisier than we like. Its interior is just as comfortable as previous-generation Camrys and it's newly styled. The center stack features a prominent boomerang styling element that separates driver and passenger in separate spaces. It's a sea-change for the Camry that has languished from inoffensive styling for decades. All Camrys sold in the U.S. are now built at Toyota's plant in Georgetown, Kentucky. The 2018 Toyota Camry’s sleek, low shape makes it the first Camry in memory to be considered stylish, with an interior that largely matches. Many of the exterior design elements were first seen in a 2014 restyling of the last Camry, but here they’re on a longer, lower, wider car. 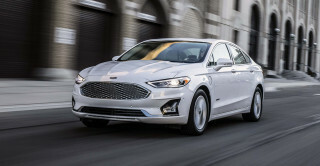 The result is crisp, racy, and stacks up well against the handsomest of the mid-size sedan class, the Ford Fusion—which can look just a little pudgy in comparison. Yet, Toyota has resisted the temptation to overdo it, as seen on the Mirai sedan and Prius hatchback, both vehicles whose lines can be reasonably viewed as bizarre. The 2018 Camry’s two-part grille has what Toyota terms "flowing" lines, with a larger Toyota badge at the center, tinted blue on Hybrid models. The body sides and rear of the car carries far more sculpting and complex shapes. Sportier SE and XSE models not only lead with a different front end and grille, but also have a revised rear bumper, a small lip spoiler on the trunk lid, and sill extensions below the doors. Frankly, we think that's all a little too much; the standard models are cleaner. Inside, the lower front seats have been entirely redesigned and a larger touchscreen dominates the center of the dashboard. Toyota has used a mix of soft-touch materials and colors to give even lower-end models a more premium impression. The 2018 Toyota Camry’s three powertrains vary a lot; the Hybrid and V-6 are most rewarding to drive, but handling is only average for the segment. The newest Camry clearly improves on the previous generation in those qualities, but it’s not particularly groundbreaking in any performance area save fuel economy. We found the base version not particularly powerful, and the specialty Hybrid and V-6 versions at either end of the performance range proved more enjoyable than the volume models. 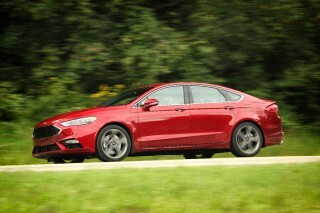 The base engine continues to be a 2.5-liter inline-4, now rated at 206 horsepower and mated to an 8-speed automatic. The 301-hp 3.5-liter V-6 is also paired with the new 8-speed automatic. The Camry Hybrid models use the latest generation of the Toyota two-motor hybrid system, first launched in the 2016 Prius. The Camry Hybrid uses a 176-hp 2.5-liter engine tuned to run most efficiently in combination with electric motors to power the car under light demand. A new Sport Mode in the Camry Hybrid lets drivers move through six simulated "gears" in the electronically continuous variable transmission if they choose; we found it largely superfluous. Like the Prius, the battery pack of the Camry Hybrids sits under the rear seat rather than in the trunk. That gives identical trunk space in the standard and hybrid models. The base Camry LE Hybrid uses a lighter lithium-ion battery pack, however, which gives it a combined EPA estimated rating of 52 mpg, the first hybrid mid-size sedan to cross the 50-mpg mark. The heavier SE and XLE hybrids use an older nickel-metal-hydride battery, and are rated at 46 mpg combined. The conventional 2.5-liter 4-cylinder models, which will be the bulk of Camry sales, comes in at an EPA-estimated rating of 32 mpg (except for the lightest Camry L, rated at 34 mpg). Finally, the thirsty V-6 gets a 26-mpg combined rating. On the road, the base 2.5-liter engine and 8-speed automatic didn’t feel all that fast. A demand for greater acceleration produced a pause followed by two and sometimes three downshifts before the car surged ahead. This is regrettably common now in new cars whose transmissions have more than six gears, and the Camry is far from the worst culprit, but neither did the 4-cylinder prove all that responsive. The V-6, on the other hand, delivered smooth, fast power in virtually any situation, and seemed to require fewer downshifts. It’s the engine to have if you want power, though it’ll cost you in fuel economy. Oddly enough, the Camry LE Hybrid we drove proved as enjoyable as the V-6, in a different way. The Camry Hybrid runs in electric-only mode quite frequently over flat roads at a variety of speeds, the engine switched on subtly, and transitions between regenerative and friction braking were imperceptible. It’s not a fast car, nor one that makes you want to drive fast, but it’s smooth, quiet, and comfortable. On the road, while the new Camry is definitely an improvement over its rather soft predecessor, we found that even the “sporty” SE and XSE models with retuned suspension didn’t feel all that sporty. Toyota has definitely improved its electric power steering, which was previously among the numbest in any car. It holds the road as well as most mid-size sedans, but the tall tires on the base LE are soft enough to feel squishy around corners on fast, winding rural roads. The larger wheels and tires of the XLE are a noticeable improvement. The best-handling Camry model was the XSE V-6 we tested, a full-bells-and-whistles model with strong acceleration, a sporty appearance, and the tautest on-road behavior of all. It’s also a minor factor in the Camry lineup, albeit a profitable one, and the LE and XLE 4-cylinder cars will likely be the highest-selling versions. Given the handling improvements we found in the Prius and C-HR, we found the new Camry a slight letdown. It’s not bad, but it’s still only about average. The 2018 Toyota Camry holds four adults comfortably; rear-door access is somewhat limited, but the interior is improved and it’s largely quite on the road. The redesigned front seats are rounded, and more deeply dished for the shape of the occupants, giving them more bolstering than in past Camrys. We found them comfortable and suitably adjustable for two reviewers of somewhat different shapes. The rear seats similarly have more dished outboard seating positions than the flatter benches of previous models. The new rear seats were comfortable too, though occupants now sit lower in back too, with a slightly more knees-up position. Also, while entry through the front doors was fine, the gap between the rear-door pillar and the front edge of the rear seat cushion is narrow and requires some maneuvering to navigate. For such a mainstream vehicle, we question whether all passengers—especially older or less mobile rear-seat riders—will find the lower seat comfortable. On the other hand, the Camry excels at offering useful storage space in a variety of trays, bins, and cubbies. With the hybrid battery now moved to a site under the rear seat, all Camry models offer 15.1 cubic feet of trunk space. That’s decent for the class, though with the steeply raked rear window, the overall opening is slightly smaller than in the older, more upright previous generation. The new Camry is less spartan this time around and emphasizes a better-looking cabin than previous generations. 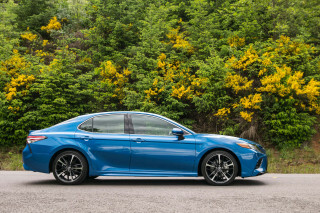 The mass-market LE version only shows its budget roots in a few small areas; there are hard plastics in the doors and we've noticed a little noisier cabin in some trim levels than we'd expect from the normally coffin-quiet Camry. Material quality and construction are up to snuff, however. The Camry feels every bit as well-made and screwed together as it should, and although we have some gripes with the center stack and the boomerang styling (it creates a small dead space inside), it feels just as solid as ever. The 2018 Toyota Camry is among the safest cars on the road today. It's hard to do better than perfect. The details: Federal testers gave the Camry five stars overall, including five stars in each sub category. The IIHS gave the Camry a Top Safety Pick+ nod thanks to top "Good" scores in every crash test including the front small overlap battery for driver and front passenger safety. Every 2018 Camry is fitted with 10 airbags and the usual suite of standard electronic safety systems. All Camrys also come with the awkwardly named Toyota Safety Sense-P, which bundles forward-collision warnings (including pedestrian detection), adaptive cruise control, lane-departure warnings with active lane control, and automatic high beams. The 2018 Toyota Camry's front crash prevention system was rated "Superior" by the IIHS for helping prevent low-speed crashes, and mitigating higher-speed crashes. The adaptive function of the cruise control covers all speeds except in the lower L, LE, and SE models, where it is restricted to higher speeds. The LE and SE versions of conventional and hybrid models offer optional blind-spot monitors with rear cross-traffic alert as part of a package of options. That feature is standard on XLE and XSE versions, and adds rear cross-traffic braking as well. A surround-view camera system on the central display combines images from four high-resolution cameras at the front, rear, and sides of the Camry. This shows the surroundings to drivers who are maneuvering in tight confines. The Pedestrian Detection function alerts drivers to standing or approaching pedestrians, both audibly and via a display notification. The 2018 Toyota Camry has a trim level for every buyer, meticulously calculated for features, options, and packages. The 2018 Toyota Camry is offered in five trim levels: a base L, a mid-grade LE, and a better-equipped XLE, plus the sporty SE and upscale XSE. Those are all powered by the 2.5-liter inline-4, but a 3.5-liter V-6 can be ordered on the XLE and XSE. Both of those engines are paired to a new 8-speed automatic transmission driving the front wheels. The Camry Hybrid comes in three versions of its own—LE, SE, and XLE—that are roughly similar to their conventional counterparts. The list of standard and optional equipment across the 10 Camry variations (L, LE, SE, XLE, XSE, XLE V-6, XSE V-6, and three Hybrids) runs 18 pages, so consider this just a few highlights. The base Camry L is largely for rental-car and taxi-fleet companies, though its 34-mpg combined EPA estimated fuel economy rating is 2 mpg higher than any other conventional Camry, largely because fewer features make it lighter. The Camry L is equipped with 16-inch wheels, a 4.2-inch driver information display, cloth upholstery, one USB port, and 7.0-inch touchscreen for infotainment. The Camry LE will be a main volume model, though Toyota says the sportier SE is consistently popular as well. The company has worked to make the “sporty” SE and XSE more visually distinctive against their LE and XLE siblings. The LE has 17-inch alloy wheels and higher-line models offer a variety of 18- and 19-inch wheels. Dual-zone automatic climate control is standard or optional on all models except the Camry L, as is wireless mobile-phone charging. All Camry models for 2018 come with a 4.2-inch display between the instruments; XLE and XSE models upgrade to a 7.2-inch color display showing more operating information. SE and LE models get fabric-trimmed seats with six-way power adjustment for the driver, while the base L model has manual adjustments. XLE and XSE models move up to eight-way power adjustable front driver and passenger seats with leather trim, including contrasting stitching on some versions—and a remarkable, vivid, very un-Toyota-like bright red color available on the XSE only. 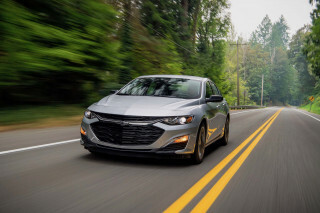 All Camrys also include the Entune 3.0 connectivity system, which connects to apps on an occupant’s smartphone and offers various navigation options depending on the trim level. Available Remote Connect includes starting and door-unlocking remotely, status notifications, and a vehicle finder. A wi-fi hotspot for up to five devices is also available. New icons have been added and the visual presentation is updated, but significantly, the 2018 Camry cannot be ordered with either Apple CarPlay or Android Auto—now a significant drawback in our view. The 2018 Toyota Camry has good fuel economy in all but the V-6 version, and the Camry Hybrid is first in its class to exceed 50 mpg combined. The 2018 Toyota Camry promised class-leading fuel-economy ratings, and it has largely delivered on that pledge. By far, the most fuel-efficient versions are the Camry Hybrids, which come in two varieties. The best is the base Camry LE Hybrid, which is fitted with a lighter lithium-ion battery pack than the other two. This produces EPA estimated ratings of 51 mpg city, 53 highway, 52 combined—making it the first hybrid mid-size sedan to exceed the 50-mpg mark. It likely will be very popular with taxi fleets around North America. The heavier SE and XLE hybrids use an older nickel-metal-hydride battery, and are rated at 44/47/46 mpg. As for that V-6, it gets EPA estimated ratings of 22/33/26 mpg in the XLE, with a highway rating 1 mpg lower in the XSE model. Just traded a 2015 Camry SE for the new 2018 version, and it is a better car in almost every category. I find the styling to sharp without suffering from either imitation Euro-blandness or from overly anime... Just traded a 2015 Camry SE for the new 2018 version, and it is a better car in almost every category. I find the styling to sharp without suffering from either imitation Euro-blandness or from overly anime inspiration. The interior fits like a glove, and everything feels and looks good. The drivers seat is far more comfortable and supporting than my old '15 had. Quality seems to be typically Toyota. Early reviews had mentioned tinny sounds and feels when the doors closed, but Toyota seems to have addressed this. Mine thunk nicely and solidly. Features are quite nice, with two glaring exceptions. I much preferred the old NAV system to Scout GPS. Scout uses your cell phone. No cell signal means no NAV. Not very helpful in the middle of nowhere. I also find having to open Entune on your phone in order to use its apps on your car to be annoying. I mostly know where I'm going and have the SiriusXM app on the phone already, so these aren't deal-breakers. Just annoying oversights that Toyota should correct. At least it has quality nobs and switches instead of those stupid touch pads that belong on a laptop instead of a car. Fuel economy is much improved over the last generation. I've got a bit of a lead foot, and am still getting 27 mpg around town. This is 4 mpg better than the 2015 Camry, while driving a bit harder. Getting in to 7th or 8th gear will turn in some stupidly high numbers, yet more passing power is just a couple of finger flicks away. They Crippled Entune 3.0 system in the name of safety. All 3 audio system models have been crippled in more than one way or another. Really love this car except for the entune 3.0 suite. It has been stripped... They Crippled Entune 3.0 system in the name of safety. All 3 audio system models have been crippled in more than one way or another. Really love this car except for the entune 3.0 suite. It has been stripped of features. Will not display music grace-note album pics except in park - now feature is worthless. Toyota salesman said it was broken. Could not believe it was now blocked while moving. They specifically restricted pic from phone book except when stopped or in park. It has restricted receipts of emails and text while the car is moving. Now you must spend more time poking on the screen. If you had previous Camrys then you miss these features instantly. Bad move on Toyota's part. See lots of complaints on different boards. Have bought 12 Toyotas in the past 15 years. Now looking at Honda Accord. Only one word for this car... AMAZING!!! The above review by The Car Connection is totally bogus. The criticisms make no sense and the logic used in rating the redesigned 2018 Camry is simply missing. It reads like something someone who knows nothing... The above review by The Car Connection is totally bogus. The criticisms make no sense and the logic used in rating the redesigned 2018 Camry is simply missing. It reads like something someone who knows nothing about cars would write. The 2018 Camry has been well reviewed elsewhere and elsewhere is where I'll be in the future. This website is a joke ! This will never get posted I'm sure, but then I don't think many people visit this site so who cares. 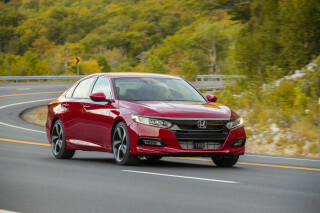 The car connection gives the Malibu with lower MGP a 8.0 for fuel economy and the Camry a 6.0...what gives there carconnection?? ?